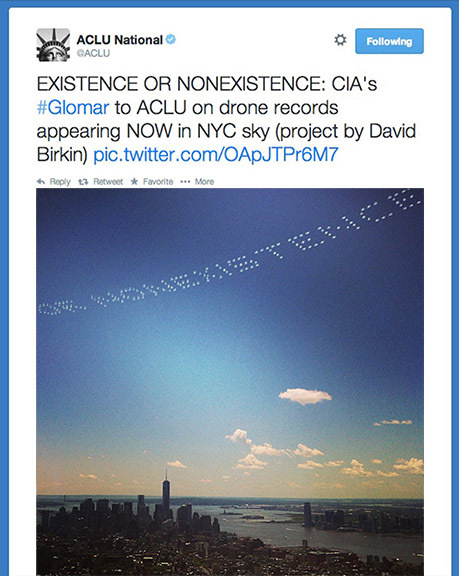 Severe Clear was a two-part public performance that took place in the skies over New York. The project borrows its title from an aviation term for unrestricted visibility, used by pilots to denote ideal flying — and bombing — conditions. Skywriting was developed by British air force pilots during the First World War as a way of communicating signals over long distances. Traumatic associations connect the skies above Waziristan, where children are often afraid to play on cloudless days because of the visibility they afford remotely piloted aircraft, with the crystalline skies across New York on the morning of September 11th, 2001, when hijacked passenger planes appeared, literally, from out of the blue.